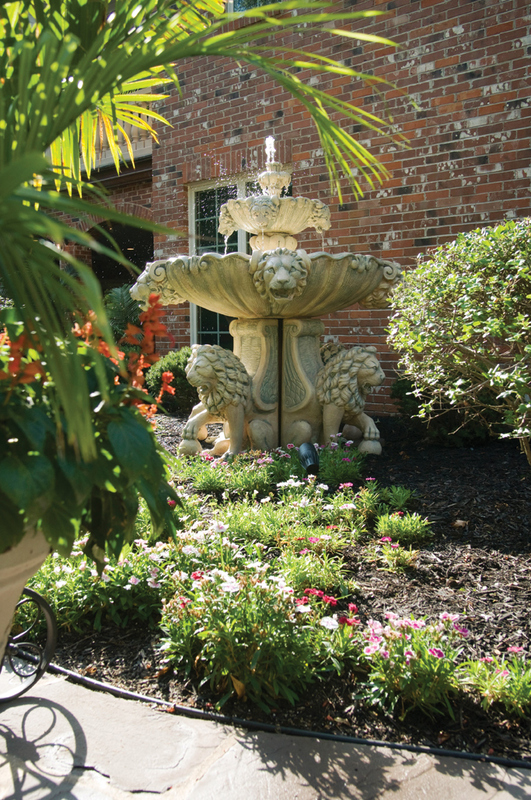 Spectacularly planted containers, a sparkling blue pool and a classic black-and-white color scheme combine in this lush Mediterranean-style landscape in Ladue. Ten years ago, when they built their stately, brick, European-style home, the owners of this Ladue residence may not have moved heaven, but they certainly moved a lot of earth to do so. 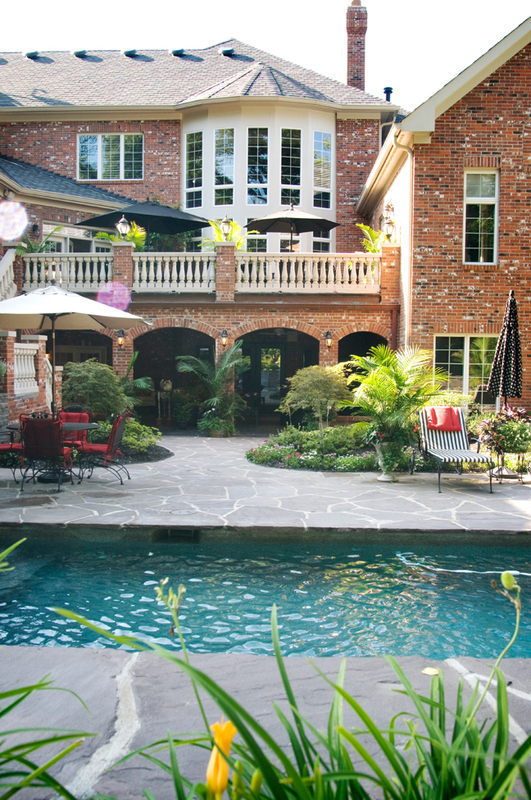 A backyard pool and a large space to entertain family and friends was a priority. “We had a long, sloping yard, and we had to push back a hillside to create a flat space,” the homeowner explains. While the effort may have been arduous, the effect is spectacular. A finely crafted, intricate stone retaining wall, constructed to hold back part of the earth, has morphed into a lengthy, spouting, three-part waterfall. From it, waves of water slide into the cool, cerulean-blue pool. 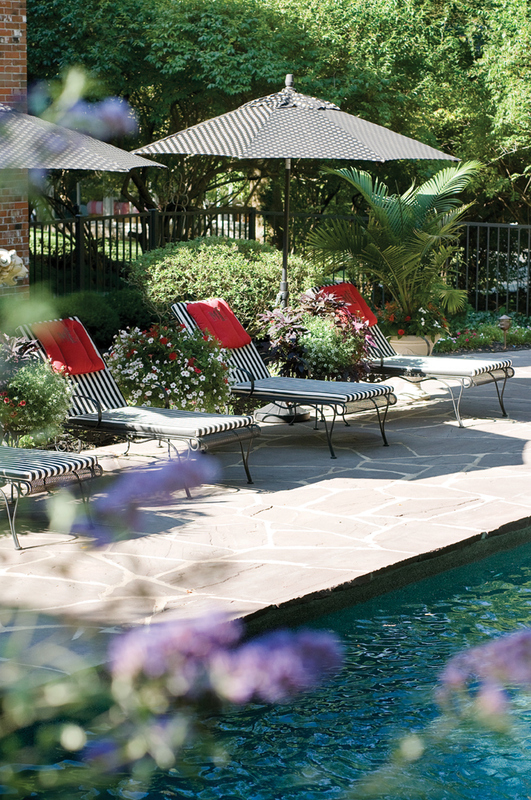 The extensive use of lilac flagstone for the pool deck and surrounding patio adds to the serene, classic appearance of the setting. Moving all that earth did more than create a level place for the pool. As viewed from the balustrade-lined terrace off the main level of the house, the pool, patio and surrounding plantings appear to be an incredibly beautiful sunken garden. The stage is set on the fern-filled upper terrace itself. 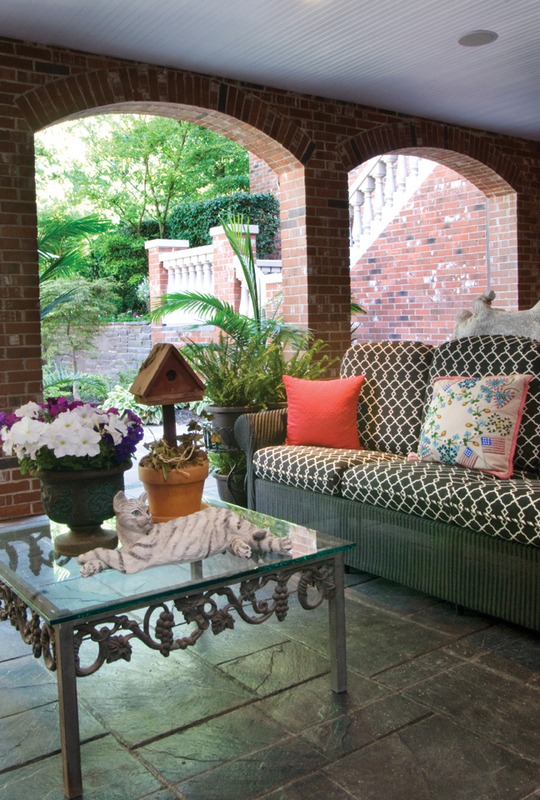 Black-wicker furniture, covered in black-and-white upholstery; black patio umbrellas, and bright-red pillows and accessories fill the space. From the terrace, a stately, curved staircase descends into a lush, Mediterranean-style courtyard reminiscent of Cannes and Monte Carlo. Classical, footed urns overflowing with tall palms inundate the space. Here, too, black furniture, this time in wrought-iron and softened by black-and-white cushions upholstered in a variety of stripes and prints, dot the area. Bright-red pillows and containers overflowing with red and white flowers provide a punch of color. On the same level as the pool, a series of brick archways mark the entrance to a covered terrace, which provides a second area for entertaining, and leads into the lower level of the home. Like the other spaces, it echoes the black, white and red color scheme that unites the entire outdoor area. At the back of the covered terrace, wide French doors provide access to the house for guests who might want a respite from the sun or summer heat. The homeowners recently put the finishing touches on that interior space, which includes a large comfortable seating area with a stone fireplace and huge, flat-screen TV; a vintage Brunswick billiard table from the 1920s; a walk-behind wet bar; a full kitchen, and a wine cellar. “My husband tells his friends that this is his wife’s idea of a man cave,” she says with a laugh. There is some permanent planting around the pool. A bed of perennial dianthus complements a series of lilacs near the house. Repeat-blooming Stella D’Oro daylilies top the fountain-filled retaining wall. Two Japanese maples mark the entrance to the lower terrace, and a living wall of evergreen viburnums helps screen the pool area from neighbors. While that planting is lovely, it is the 16 palm-filled containers and baskets of ferns and flowers that set the stage and steal the show in this garden. The homeowners have transformed the use of containers into a highly skilled art. When she first began using palm-filled containers, it was an arduous cycle; buy small palms in the spring, haul them home, plant both palms and flowers in the containers and toss out the frost-killed palms and flowers in the fall, she recounts. “I use 16 majesty palms. Replanting them every year was so labor intensive, plus they always started out small. One year I had enough. I got on the phone and started calling until I found Walter Knoll (Florists) who would pick them up in the fall, store them through the winter and bring them back in the spring. “The cost of doing that, compared to buying everything new in the spring, is pretty much a wash, and they are tall and beautiful when they arrive back in May. All I have to do is plant flowers around them. They are in footed, lightweight, composite containers that I can move around by myself,” she explains. The multiple containers of ferns also are a movable feast for the eye. Day by day, they enhance the yard; when company comes, they go on plant stands already positioned on the terraces. While the homeowners only have been in their current home for 10 years, many of the wicker furniture pieces are treasured friends from previous settings. “We’ve had some of the wicker furniture for 25 years,” she estimates. “I’ve looked for deals and collected it from various places. I’ve had replacement cushions made and resprayed it to keep it looking fresh." Her knack for combining a variety of prints, accessories and both treasured and new furniture, she modestly calls “a hobby.” As to the stately home she also has decorated: “It’s my little dollhouse,” she says.